Abstract: The paper describes a method for including topographic effects in a thermo-visco-elastic model. An approximate methodology for the consideration of topography in the computation of thermo-viscoelastic displacement and gravity changes was used. It gave us a relatively general and simple solution useful for solving the inverse problem. Our results show that for volcanic areas with an important relief, the perturbation of the thermo-viscoelastic solution (deformation and total gravity anomaly) due to topography can be quite significant. In consequence, neglect of topographic effects can give a rise to significant errors in the estimation of surface displacements and gravity changes, and therefore in the estimation of the intrusion characteristics obtained solving the inverse problem. Abstract: Stratigraphic and structural investigations based on geological mapping in the Kis-fennsik region (NE part of the Bükk Mts, NE Hungary) proved the complex nappe structure of the area. According to new biostratigraphic data and structural setting, three main tectonostratigraphic units can be distinguished: in lowest structural position Carboniferous to Triassic deposits of the Bükk Parautochthonous Unit are forming a huge south-vergent anticline (North Bükk Anticline NBA). The Szarvaskő-type Harica Nappe (HN, representing the upper part of the Jurassic) is thrust over the northern limb of the anticline. After the emplacement of the Harica Nappe, Middle-Upper Triassic rocks of the North Bükk Anticline (Szeleta sliver, NBA/b) are thrust onto the HN unit, and along an E-W striking thrust fault onto the older part of the NBA unit. In the southern part of the investigated area a narrow zone of platform carbonates and dark shales (Vesszős Formation) was mapped. Together with the overlying thick cherty limestone succession, they are considered to belong to the NBA/b unit. All the above mentioned units, affected by regional dynamothermal metamorphism, are overlain by the Kisfennsik Nappe (KN), which consists of slightly metamorphosed Carnian platform limestones and dolomites, with some intercalating metavolcanites. Emplacement of the thrust sheet to the SE resulted in small- to map-scale folding in the North Bükk Anticline. Thrusting is attributed to the Cretaceous tectonometamorphic evolution of the Bükkium. Later, an intensive shortening generated well-developed, NE-SW oriented antiform-synform structures with reverse faults in all units. Folds with NW-SE axis represent another deformation phase. Abstract: The use of gravimetry, as one of the geophysical methods for identification of brittle deformations — faults active during the neo-Alpine development of the Western Carpathians, confirmed its role in research of the orogene geodynamic evolution. The study of several sites in the western part of the Western Carpathians documents the fact, that the maps obtained by means of different effective gravimetric methods of transformations and visualization of gravity (potential field) data can be correlated well with the age, and thus also with the depth of the faults. The map of the total Bouguer gravity anomaly displays faults without distinguishing their age and depth. In such case the use of the Linsser method is proper for the detection of faults or density boundaries. While the derived maps, such as the vertical and horizontal gradients, and the residual anomaly maps, document the faults depending on the type of transformation and visualization of the input computation parameters. The results and interpretation indicate, that the map of residual anomalies displays mainly the deep faults of the initial rifting and of the synrift stage of the back-arc basin development and the map of the vertical gradient displays most of all the young shallow marginal faults and faults linked with the postrift thermal subsidence stage and tectonic inversion of the basin. 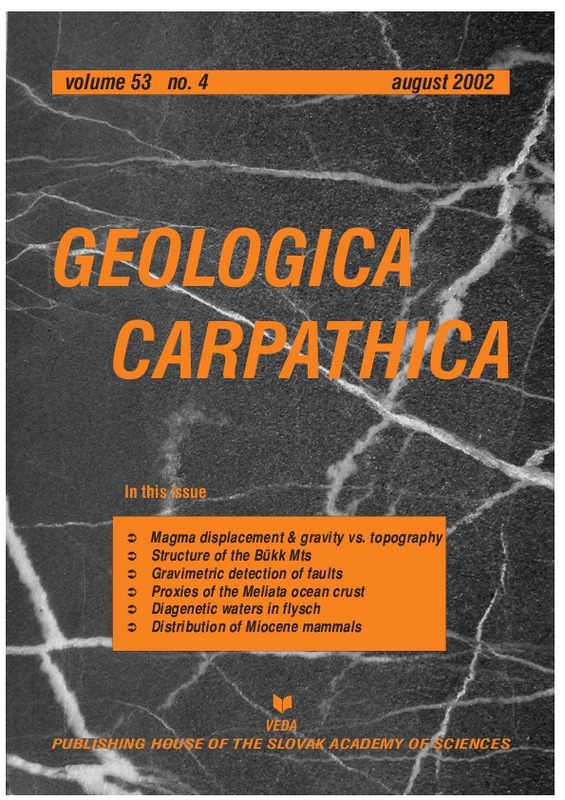 Abstract: Relics of the oceanic crust of the Triassic-Jurassic Meliata Ocean are preserved as dismembered incomplete ophiolite sequences only in several small lithostratigraphic units mostly in the Inner Western Carpathians. The current data on these remnants with special emphasis on volcanic rocks are summarized in the present paper. Mafic volcanic rocks representing relics of the Meliata oceanic crust differ from each other by the following characteristics: (1) preservation of magmatic textures and structures, (2) geochemical type, (3) metamorphic evolution, (4) related sedimentary rocks and (5) recent tectonic position. On the basis of these differences, three groups of metabasalts related to the former oceanic floor can be discerned: (1) HP/LT metamorphosed basalts and dolerites with scarce gabbro as slices and small blocks in the Borka Nappe, (2) mostly LP/LT metamorphosed basalts and dolerites occurring as olistoliths in melange in the Jaklovce, Meliata, Bódva Valley Ophiolite and Darnó Hill Formations, and (3) recycled, almost complete ophiolite magmatic rocks forming clasts in the Upper Cretaceous Gosau-type conglomerate from Dobsinska Ladova Jaskyna village. The distribution of relatively immobile trace elements (REE, HFSE) in metabasalts indicates their formation in the back-arc setting. In the initial stage of opening of the Meliata Ocean, the arc-like and back-arc basin basalts, erupted in the environment of carbonate or pelitic sediments, were generated. The evolved stage is characterized by generation of basalts close to the N-MORB type in association with abyssal sediments. Basalts close to E-MORB are assumed to be a melting product of an enriched mantle source probably locally present beneath the spreading basin. Closure of this ocean in the Middle Jurassic time was related to the subduction and formation of the accretionary prism. Mostly the relics of the marginal parts of the former oceanic basin were subducted and consequently exhumed, whereas the relics of central parts were preserved in the accretionary prism. The original location of the Meliata Ocean suture is not known. The present-day tectonic position of the oceanic crust relics in the Inner Western Carpathians is extremely complex as a consequence of the repeated nappe forming activity, erosion and plate kinematics. It seems likely that these relics represent a western continuation of the Hellenide-Dinaride ophiolites displaced by microplate motions in the Miocene. Abstract: The origin of CO2-rich chloride waters in the Polish Flysch Carpathians is the subject of controversies. They often contain a non-meteoric component, with isotopic composition characteristic for dehydration waters released in metamorphic processes, that is δ18O≡ +6.5 ‰ and δ2H ≡ -25 ‰. However, comparison with other known occurrences of waters of a similar isotopic composition suggests that they mainly result from the transformation of smectites to illities during the burial diagenesis of flysch sediments. These waters are characterized by high chloride contents (up to about 14 g/l), which differ in different regions, and remain difficult to explain as the δ18O and δ2H values are slightly scattered and do not show any distinct contribution of marine water. It is shown that such waters are also characterized by high ratios of Na+/Cl– and B/Cl–, which can be useful in their identification. Particularly interesting waters occur in the four deepest wells of the Krynica Spa, which undoubtedly contain a non-meteoric chloride component. Their positions on δ18O-δ2H diagrams are scattered to the left from a typical mixing line of meteoric waters with dehydration waters, which makes it difficult to determine their origin. However, they can be regarded as containing different percentages of a dehydration component because their Cl–-δ2H relation is linear and similar to typical mixing lines of dehydration waters with meteoric waters. The untypical positions of these waters on the δ18O-δ2H diagram can be explained by isotopic shifts of δ18O from a typical mixing line to more negative values, supposedly caused by isotopic exchange of oxygen between CO2 and water. In that process, small volumes of water are involved, as deduced from very slow flow rates in rocks of a low porosity, and a large amount of CO2, as deduced from very high pressures measured at well heads, and an eruption of CO2, which occurred during drilling one of the wells. Abstract: Mammal fossils are found relatively rarely in the Miocene deposits of Slovakia. So far, eleven Miocene mammal localities are known. They cover a time span from the Middle Badenian to the Pannonian. Miocene mammals have been found mostly at the NE margin of the Vienna Basin (Zapfe’s fissures, Sandberg, Bonanza, Wait Quarry, Glavica, Dubravska hlavica, and Borsky Svaty Jur). However, some localities are also known from the northern part of the Danube Basin (Pezinok, Topolcany-Kalvaria, and Novaky) and from the northern margin of the Transcarpathian (East Slovak) Basin (Kosice-Bankov). The article provides a review of Slovak Miocene sites of fossil mammals and updates some older stratigraphical data.